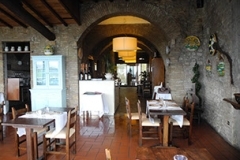 For five generations the Bel Soggiorno restaurant has been a vital part of the San Gimignano scenario, with its typical dishes inspired by the Tuscan tradition. 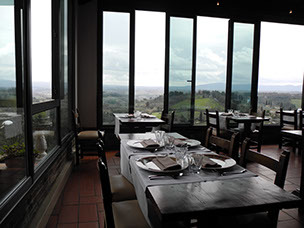 Our restaurant is on the main street of San Gimignano and has a wonderful panoramic terrace from which you will enjoy the view of the beautiful Tuscan countryside. 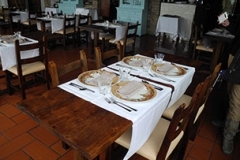 The elegant setting, with terracotta paving and oak-beamed ceiling, adds a pleasant and warm atmosphere to your lunch or dinner, whether for couples or for huge groups. Our qualified personnel will help you in the choice of our dishes and the match with wines from our rich wine cellar. 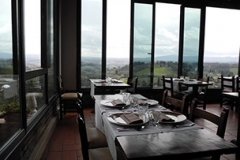 Eating is an experience, every dish from our menu is meant to let you discover antique scents and flavours; spices and herbs perfectly mixed with typical ingredients will let you experience Tuscan Cuisine at its best.